This series of lessons delve deeply into how to dissect modes for guitar, and teaches you a multi-layered method for soloing and composing melodies with their unique texture and tonality. You will learn how to use substitute triads, arpeggios and pentatonic scales to create new, interesting sounds and 5 useful modern licks for each mode to get you playing appropriate sounding lead lines on guitar. All the audio examples and the backing track by Quist in this series are available for free from Please download them so you can hear all these theoretical concepts in action. These lessons on how to dissect modes for guitar are a sample of the much more comprehensive work, The Practical Guide to Modern Music Theory for Guitarists. A mode is a scale which has been generated or derived from a parent scale. In these lessons we focus on the 7 modes that are derived from the major scale. To derive a mode from the major scale, you start on any note that isn’t the root of the major scale, and make that the root of a new scale. You then play through the notes of the parent scale beginning and ending on the new root. We have created a new scale. In this case, we have created the Dorian mode. E F G A B C D E is named the Phrygian mode. F to F is the Lydian mode. G to G is the Mixolydian mode. A to A is the Aeolian mode. B to B is the Locrian mode. Sometimes the parent major scale, C to C is named the Ionian mode, however that isn’t particularly common these days. An extremely important fact to remember is that most music for the past 800 years has been written around the major scale and its harmony. Western ears have been conditioned since birth to hear melodies in relation to this major scale. Because the modes we are now studying are built from this major scale, playing them in isolation will tend to make you hear them as wanting to resolve to the root of the parent major scale. This destroys the modal characteristics and the end result is that you simply hear the major scale starting from a different note. For example, play and listen to example 10a. It is one octave of the D Dorian mode. When you get to the bottom of the scale, do your ears want to carry on one more note to the C, the root of the parent scale? Now try listening to example 10b where I play exactly the same thing. However this time there is a chordal backing track built from strong chords of the Dorian mode. Because your ears have framed the notes around these chords they will allow you to hear the notes in the context of the D root. It is not always necessary to build a complex chord progression from a mode to accurately hear its unique tonality: Often in rock music, power chords or simple riffs are used to outline a key centre with little more harmonic information than the root and 5th of each chord. However, in this book I will give you some specifically modal chord progressions which highlight the character of each mode. Why do Modes Sound Different to the Major Scale? Think of a scale as being a ladder with rungs set in a specific pattern between 2 notes e.g., C – C. A mode is simply a different spacing of these rungs. Because the rungs are spaced differently, the mode has a different sound, especially when you consider that the chords built from harmonising the mode will be different. For example, chord I in the major scale is a major 7th, but when we harmonise the Dorian mode, chord I is now a minor 7. – Instantly we have created a different mood. By carefully selecting chords we can bring out the unique character of each modal sound. Let us look at the scale pattern of tones and semitones formed by the D Dorian mode, and then compare it to the D Major scale. Remember, the equivalent major scale is always our point of comparison to describe any musical sound. It can be seen that instead of the F# note in the D major scale, D Dorian has an F Natural. In other words the 3rd note, F# has been flattened. This is written as ‘b3’. It can also be seen that instead of the C# note in the D major scale, D Dorian has a C Natural. In other words, the 7th note, C# has been flattened. This is written as ‘b7’. 1 2 b3 4 5 6 b7. If you remember that a minor chord has a b3, you will already begin to realise that D Dorian will sound very different from D major. The first arpeggio, 1 b3 5 b7 outlines a minor 7 chord so this mode will have a fairly sad sounding quality. This new pattern of tones and semitones in a mode creates a different mood from the original major scale. This mood is emphasised by playing the modal scale over chord progressions or riffs that strongly outline chords that are derived from the harmonised mode. It is very important at first to allow the harmony (chord progression) to ‘set up’ the sound of the mode. The listener’s ear needs to accept the that fact the mode does not resolve to the root of the parent major scale. By ‘framing’ the modal context of the scale with chords, the listener will accept and hear the new interval structure of the mode you are using. Instead of viewing a scale as simply a long sequence of notes, the modern way to approach improvising with scales is to split them up into small subdivisions. In this way we dissect modes for guitar. 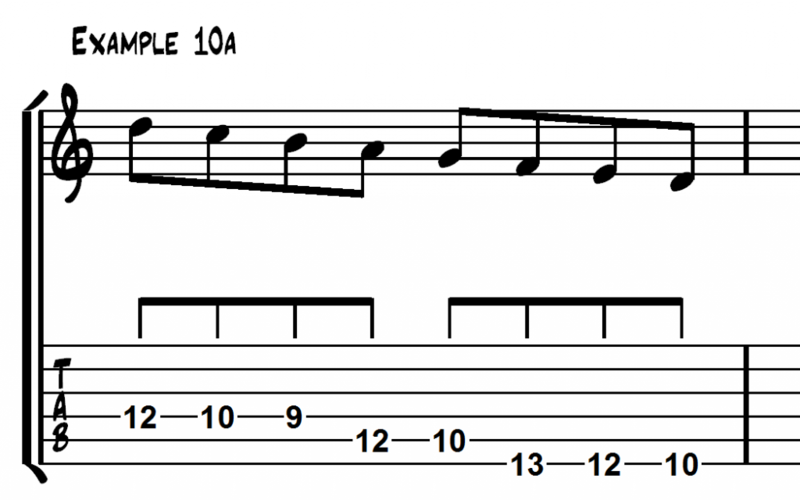 Hiding within each scale are various melodic ‘units’ that we can use as unique soloing concepts. By viewing any scale as a set of smaller chunks, it is easy to find new ways to play and be creative. One of the main benefits of this is that instead of playing scalically, we automatically introduce jumps and leaps into our playing which help to break up the monotony of long step-wise lines. Another important advantage of this is that we can ‘cherry pick’ the colourful notes of a scale and imply its unique colour by only playing a limited number of notes. An interval is the distance between two notes. Just as we formed chords by leapfrogging one note in the major scale, e.g. C – E, (intervals of a 3rd) we can jump other distances, for example, two notes; C – F (4ths), three notes, C – G (5ths) etc. By skipping intervals when we play, we start to break up the linear nature of a scale. We introduce melodic leaps and patterns. While the overall tonality of the mode we are playing remains the same, you may be surprised at the different textures we can create by ‘thinking’ intervals instead of scales. In Part One, we used triads to form chords. One triad is 3 skipped 3rds, e.g. C – E – G. However, we do not have to play them simultaneously as a chord. If we play the notes one after another we generate many melodic possibilities by leaving out most of the scale tones. A triad, as you know, can be formed on every note of a scale, e.g. C-E-G, D-F-A, E-G-B etc. When we pick out specific triads instead of using full scales we can ‘cherry pick’ the scale degrees that we play in our solos. By taking a triadic approach instead of a scalic one, we not only target the specific scale tones we want to hear, we automatically introduce melodic leaps into our playing and move away from predictable scale ‘runs’. Triads do not have to be played in order, for example, CEG is the same triad as EGC. This gives us a myriad of soloing possibilities. In a similar fashion to 3 note triads, 4 note arpeggios are simply triads that have an extra 3rd added on top, (in other words, a 7th chord). Instead of playing the triad C-E-G, we extend it so it becomes an arpeggio: C-E-G-B. Once again, we do not have to play these notes in order so the permutations now possible are immense. There is an arpeggio choice built off every note of each scale and again, we are being selective about the scale degrees we play. Most players see a chord progression in the key of A, and immediately play an A minor pentatonic scale. In actual fact, you can build minor pentatonic scales on various degrees of any major mode, not just the root. There are 3 minor pentatonic scales hiding within each mode of the major scale. Knowing where these are instantly allows us to use many of the pentatonic licks we already know to give a rich modal sound. As you can imagine, tripling your existing licks in this way is extremely useful. I will give you all the available choices for each mode, however, these multiple possibilities can become overwhelming extremely quickly when you are just starting out. Most musicians, even very accomplished ones, normally have a limited range of favourite approaches. To help get you started, I will give you my first choices at the end of each lesson.